The MGM (Motivational Gift MIX) is a free assessment tool and report that helps participants understand their motivational gifts based on Romans 12 in the Bible. The assessment’s 100 questions help identify and rank all seven motivational gifts. The assessment takes about 15 to 20 minutes to complete. The assessment is mobile ready for smart phones and tablets. Assessment Groups Assessment groups provide an easy way to share the assessment link and results with a group leader. Group reports provide an easy way to share and discuss results with others. Use any group you like. For example, people have created groups out of families, classrooms, Bible studies, ministry teams, volunteers, departments or leadership teams. Do you need help setting up a group? Talk to an Authorized Advisor for your group setup, it’s easy and only takes a few minutes. Advisors provide debriefs to help participants understand their report results. Debriefs may take place in person or by phone. Plan on 1 to 1½ hours for your debrief. Our goal for a debrief session is to encourage you and give you key memory points as a take-a-way including suggested verses to ponder or memorize. Your top gift mix may include more than the two gifts outlined in your report. If this is the case, your advisor will help you understand all of your top gifts. Your advisor will also help you understand how to use your MGM results to filter life’s major decisions. Advisors are independent of Life Outfitter and most charge a fee for their services. Encouragement/training seminars are offered through on-line webinars and as live events in Loveland Colorado. Seminars are open to any Authorized Advisor at a nominal charge. Our goal is to encourage and equip Authorized Advisors to debrief and encourage their MGM participants. Ken Hoornbeek, the key architect of the MGM has over 44 years of business and ministry experience. One of his passions is encouraging and equipping small business owners and ministry leaders. This 300 + page book is filled with insightful, personal stories and great resource materials about motivational gifts. 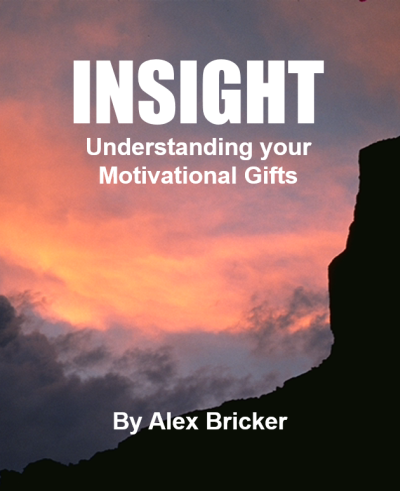 The author, Alex Bricker, learned firsthand how understanding his motivational gifts brought clarity to his life after taking the MGM. Alex, a graduate of Denver Seminary, has written this book with a captivating personal style that is easy to read. In addition to the personal stories, Alex unpacks the concepts and practical application of understanding our God given gifts, making this book a must read for anybody who takes the MGM* assessment.